My Take: I was so astounded to see a bottle of Peachy Canyon in the store, that I reached for it, quite forgetting that the last time I’d been to Peachy Canyon Winery, I hadn’t been impressed with the wines at all. Also, the Incredible Red part of the label is big – I thought it was a blend. It wasn’t until I got home that I realized it was a Zinfandel blend. But I like Zins, so I was pleased. The wine itself was also pleasing. There is truth in advertising on this label – it is, indeed, “a great Zinfandel for everyday enjoyment”. It’s not too deep, not very thought-provoking – just tasty and welcoming. I might have to stop at Peachy Canyon, the next time I’m in Paso Robles. My Take ~ Very Drinkable ~ Plus it has the added benefit of being a California wine that isn’t often on the grocery store shelves. A nice little tidbit to share when you arrive at your Holiday party. My Take: I’ve been a fan of Folie a Deux since I first found them a few years ago. Their red blends, however, do vary from year to year. 2009 was not Hubby’s favorite year; 2010 seems to be faring better, taste-wise. The label is nicely brief, and the name will give a certain panache to both the giver and the giftee, especially when presented with a wink and a smile in front of a wide-eyed audience. It is not, however, my favorite red blend. My Rating: ~ Drinkable ~ Hubby liked this one better than I did, and would rate it higher on the Christine scale. So be it! My Take: Despite the chatty label, this is one wine you want to spend the extra cash on. It’s a step above their normal line (hence the “reserve” in the title) and it shows in a luscious feel in your mouth. This is definitely a wine to save for dinner; that first sip will allow you to relax and enjoy the rest of the evening. Complex, but not too complex (it is a Pinot Noir, after all), it’s a satisfying wine with an elegant label. My Rating: Very, Very Drinkable This is one wine you will never be ashamed to give, and will be delighted to receive. 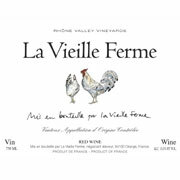 La Vieille Ferme Recolte 2010 Rhone Valley Vineyards Red Wine 1.5 L; Alcohol 13.5% by volume $9.99 at Costco La Vieille Ferme online. On the Label: “This full-bodied and fruity wine comes from vines grown high on the slopes of Mount Ventoux, one of the best vineyards in the Rhone Valley. It has been meticulously selected and blended by the Perrin Family, who also produce one of Frances most acclaimed wines: Chateau de Beaucastel. The blend of Grenache, Syrah, Carignan, and Cinsault grapes has produced a typical Rhone valley style full of fruit and spice aromas, it has soft tannins and good body. Winemaker interviews, recipe ideasl, for all details: www.vincod.com/VFROE . My Take: Well. This is the Chameleon wine. I must warn you my friends, Chameleon wines don’t always change for the better. I cannot swear this wine changed for the better. But I digress. I was off at a party last Saturday night, without the hubby (all-girl party); Hubby opened this big bottle sitting on the counter. When I came home a couple hours later, he was still complaining about it. “Thick and viscous” were the words he used. The next morning, he made me take a sip of it before we went off to my company holiday brunch – it was not a good way to start my morning. The next day, however, I had a glass while cooking. Well, I had half a glass – I couldn’t finish it. It was like the wine hadn’t made up its mind what it wanted to be. It started to open up, but it was also getting watery. Very strange. The third day, we had nothing else open so I had another glass. This time, I finished it. And poured myself another. The taste still wasn’t the best – hubby could only drink it by adding water to it. If we had mulled it, I’m not entirely sure it wouldn’t have been a waste of brandy. Times being what they are, though, I couldn’t bring myself to pour it out. By the end of the week, it had become a more or less presentable table wine. Something fine for us, but nothing I’d want to press on anyone else. Which is really too bad – it’s a nice-looking bottle, and at $10 for 1.5 L, a bargain and a nice presentation to a host/hostess – but the taste rendered it ungiftable. I am VERY glad I didn’t take that bottle to the Saturday night party, as originally planned! Why did the wine change so much? Well, wine can do that. Maybe it had rough handling crossing the Atlantic from France. Or maybe the 2010 vintage just needs more down time, and next year it’ll be a lot better. I don’t know, but I’m pretty sure I won’t go down this path with this wine again. My Rating: ~ Undrinkable Chameleon Wine – Stay Away ~ Don’t let the nice bottle, the cheap price, and the French on the label change your mind. Bad wine is bad wine at any price. This entry was posted in Wine Friday and tagged Blackstone Sonoma Reserve, Christine Ashworth, demon soul, Folie a Deux, France, La Vieille Ferme, Napa Valley, Peachy Canyon, Pinot Noir, Sonoma County, Wine, Zinfandel. Bookmark the permalink. I love the Sonoma wines. Blackstone really is good. That price is excellent and I will take a look at my Vons here in the desert. Hope they have it. I think I’ll forgo your chameleon.